Ory & Associates Architecture Studios used KRION not only in the 6,000m2 of ventilated facade; it also took advantage of the properties of the solid surface from PORCELANOSA Group for different finishes on the interior of this modernist building with classic references. 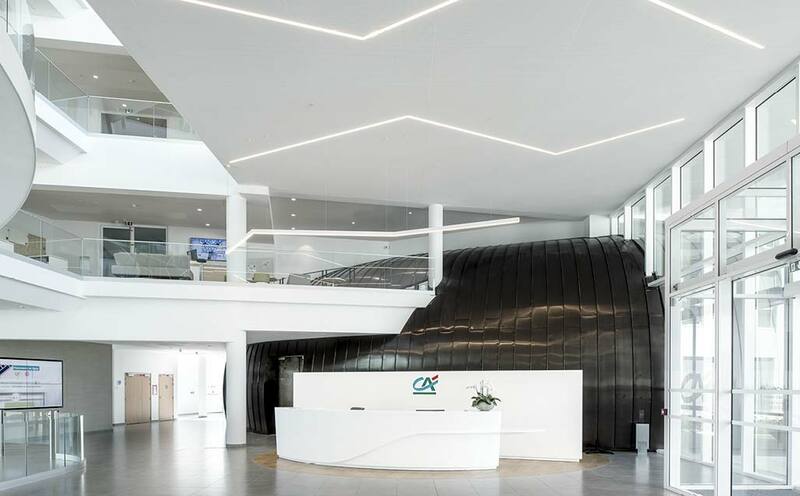 After amazing us with its spectacular facade, we find a large hall which extends the facade inside, finished with a curved reception made with KRION 1100 Snow White, and a low wall separating the area in which the Crédit Agricole logo is found. Another high-transit area where the additive-free antibacterial property is essential are the bathrooms. Here we can find washbasins made with KRION 1100 Snow White, in special formats with a triangular configuration, to large format double washbasins, small format double washbasins, and triple washbasins. To complete our look at the use of KRION in this emblematic project by Ory & Associates Architecture Studios, we enter the conference room, where we find KRION transformed into two lecterns which contain the milled low relieve logo, perfectly combined with the wooden floor and walls and red furniture. It is a symmetrical space matching the beauty of the rest of the building.